Editions comparison Support Download AllMusicConverter! Download Media Suite! Buy Now! preserves ID3 tags for artist, album, title names, etc. Get 64% cost saving on this 5-in-1 solution! Buy for only $59.99 instead of $105.96! Any music that you listen to on your PC can also be played on your audio player or mobile device. Just convert it with AllMusicConverter quickly and without losing original quality. With just a few mouse clicks you can enjoy all your songs on iPod, any other MP3 player, CD player, PC or mobile phone - without any restrictions. AllMusicConverter is easy to install and use with a very handy and clean user interface. The program lets you choose the compression level and preserves ID3 tags for artist, album, title names, etc. Batch mode along with drag&drop function for folders and files allow conversion of large music collections with just 1 click. It contains FREE CD Ripper for your audio discs. 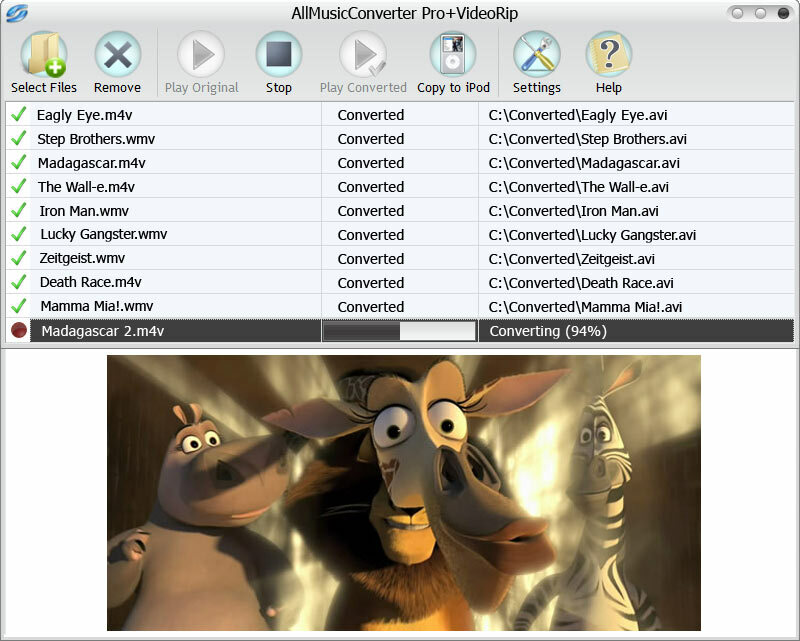 AllMusicConverter also can convert any video files to MP4 (iPod format), WMV (Windows computer format) or AVI (DVD player format). Download AllMusicConverter! Buy AllMusicConverter! Download Media Suite! Buy Media Suite!